The search engine optimization (SEO) is a good chance to promote your blog on Google search results and other search engines. For those who don't understand how SEO works, I've posted some articles on this blog that may help, but it's important to understand that there are good and bad techniques that could have a direct impact on your ranking. So, in this post I'll talk about the terms known to those who are familiar with SEO - the black and white hat - and we will get to know what's good and what is not when we think about optimizing our website and its content. From the 'SEO dictionary', the term black hat has to do with the abusive techniques that will force the search engines to look at a specific site and rank it. This might work at first, but the algorithms can already see some of these techniques that have become common for a fast result. Such practices to trick the search engines are, for example, the excessive use of keywords, especially in headings and subheadings; transparent keywords to the user - the so-called hidden text, automatically generated content, pages redirecting automatically to other content and more. 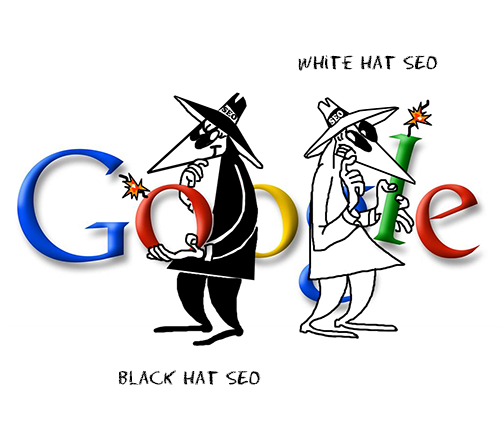 The white hat has to do with the good techniques in the 'eyes' of search engines. These are considered ethical techniques for the ranking, helping, thus, the positioning of a website or blog. However, working the white hat is a process that requires dedication and results may take longer to appear (this is why so many people opt for black hat in order to 'try' something more 'effective') but the results could be much more stable and satisfactory. Keep in mind that Google has good tricks up its sleeve to penalize anyone who doesn't act in accordance with the policies and rules of their website - this includes removing your page from any of the positions. Fair enough, after all, why Google would 'reward' somebody with the top spot if he doesn't provide good content for his users and, at the same time, doesn't meet the requirements of the algorithm? For those who are interested and want to stay on top of Google search results, visit this webmaster guidelines page. There, you can find further information about how to create a good content, how the design of your blog/site should be and how to work with your links. There you can also find mentions about black hat techniques.